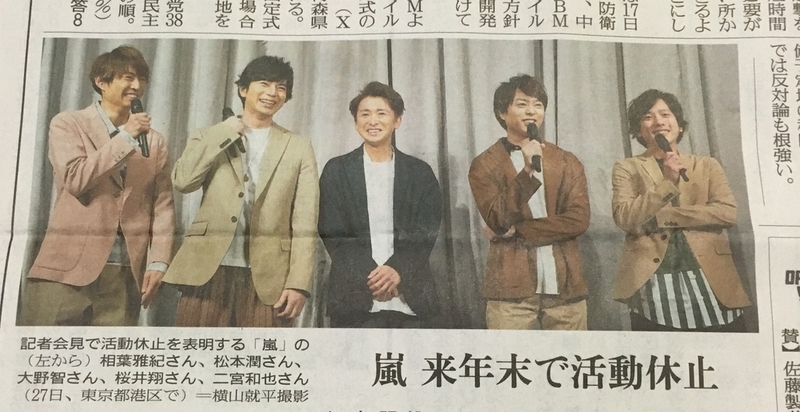 On January 27th, 2019, Arashi announced that they would go on hiatus at the end of 2020. It was made clear on its fans-only website. Arashi is a male Japanese group consisting of five members.
" Around the middle of June 2017, I told other members that I wanted to end the activities as Arashi for now." " I've discussed this many times with them and decided that the date will be the end of 2020." They made their debut CD in November, 1999. Arashi made its first appearance on " Kohaku ," NHK's famous music show on New Year's Eve in 2009. They have been active as a group and individually, not only in music but also in movies, dramas, variety shows and commercials.